Test 1: Does It Work? We created a dozen cells, in two sets of six. For the purpose of experimentation, there were two different situations which we varied, resulting in four possible combinations. The first option was whether or not it was initially cleaned with hydrofluoric acid; the second was whether a thick or a thin layer of silver-aluminum was placed on the back of the cell. The following chart lists the twelve cells, their names, whether they were cleaned with HF, and if they have thin or thick back metal. 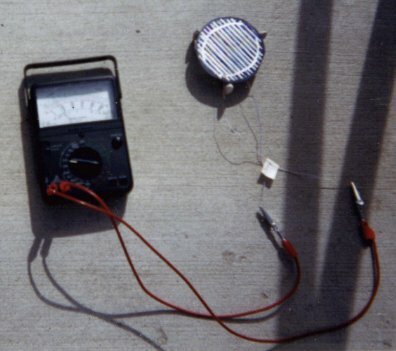 This test was a mere voltmeter test to see if the cell worked. 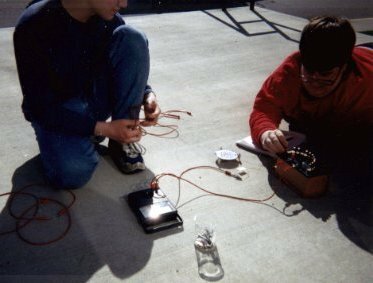 We took the cells outside on a sunny day, connected the voltmeter to the two wires coming off of the cell, and if the voltmeter showed any current, the cell worked. Our second test involved hooking the cell up to a voltmeter with amperage readout capabilities, and an ohm box, in series. Using a logarithmic scale of base 10, various amounts of resistance were provided, ranging from 0.1 ohms to 100 ohms. The amperage was recorded for each of these ohm readings, for each of the 12 cells. For consistancy, the tests were performed under a lamp, rather than the sun which would provide various amounts of light.